"Scrapbook" sites such as MySpace. By controlling the access to such sites and by having their own profiles on the site, Vodafone can release information effectively to its target audience. Social networking sites are websites designed with the primary purpose of meeting new people or keeping in touch with your existing network of friends. If you're a musician you could be using a social networking site to promote your music to others. If you're a physics graduate belonging to a physics department, you could be looking for other academics to debate and discuss the latest physics theories. 5) Ability to share information, for example photos and music songs. 6) Ability to receive updates on linked profiles. Blogs, forums, chatrooms, messengers and online dating sites are traditional forms of social networking websites on the internet. The average person today wouldn't consider these social networking websites or social networking programs. However you get a profile which allows you to interact with other users and you can link to other websites. Conceptually speaking, these programs and websites are allowing you to do the same thing - to meet others with similar interests online and share information. Sites like these can be best thought of as notepads, jotter books or notice boards. They are plain and simple. But that is precisely why people use them. They aren't fancy, just functional. Blogger - Where you can sign up and create your own blog. Yahoo Message Boards - Where you can post messages. Big Boards - Where you can search for forums or message boards to join. ICQ - A popular messenger service where you can create or join chatrooms as well message your friends. These are sites like Youtube, Imeem and Flickr where profiles are based around a certain media or collections of that kind of media. For example, Youtube is focused on video clips so users can watch video clips, discuss them, share them and save them to their profile or favourites. Like an insect catcher that goes around catching insects and then preserving them in special cases, users of these sites are focused on catching or collecting one form of media and then sharing what they have with others. By focusing on just one form of media, it allows the site to ensure content is properly delivered. Youtube - Where you can upload, share and watch videos. Imeem - Where you can upload and trade music files. Flickr - Where you can upload, share and watch videos photos. StumbleUpon - Where you can share and recommend interesting websites and weblinks. According to Alexa Top 500 Sites, Youtube ranks as one of the top 10 websites visited globally. These are sites such as Bebo and MySpace where each profile provides an online space that allows you to do a variety of things. You could blog, upload photos, share videos, post messages, create polls and other such activities on your profile. Websites like this are the newest and latest craze. When people say social networking site, this is what they usually mean. Having a profile on one of these sites can be thought of like owning a scrapbook and keeping it in a pile of other people's scrapbooks. You can paste photos into your scrapbook and scribble in your thoughts. You can share your scrapbook with friends and take a look at their scrapbooks. You can also look at the scrapbooks of people you don't know and see if their owners have similar interests. Like a swiss army knife, you can do plenty of things on websites like this. However just like a swiss army knife each tool or feature of the website isn't necessarily the best for the job. For example, Youtube has servers dedicated to storing videos and is already well known. While you can do the same in MySpace and Bebo, you may not necessarily want to because Youtube is simply better at storing videos and there is also a strong video watching community. According to Alexa Top 500 Sites, social networking site MySpace consistently ranks as one of the top 10 websites visited globally. MySpace - The extremely popular social networking website. 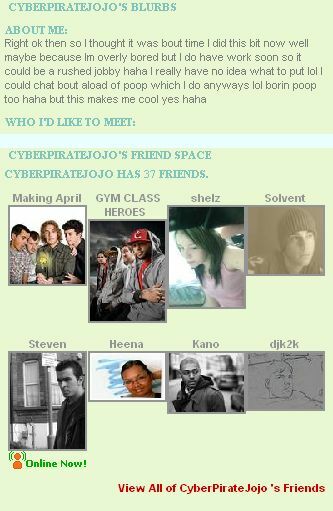 Bebo - The cooler alternative to Myspace. Facebook - Originally for university students this has gained rapid popularity ever since it went public last year. Friendster - Once popular but overtaken by MySpace. Hi5 - An up and coming social networking site for cool people. Xing - A social networking site specifically for business people to network. Linkedin - A social networking site also for more professional networking. Vodafone MySpace - Vodafone UK's official MySpace profile. Self Central - Vodafone New Zealand's experimental mobile phone social network. 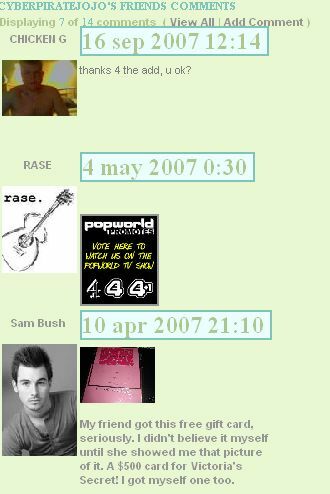 Lets take a look at a simple MySpace profile on the UK MySpace to get a feel of what a social networking page is. On the left there is a box to contact 'cyberpiratejojo' as well as her interests. On the right is her friend network and a blurb about her. On the bottom is a board where people can leave comments. Here are links to a couple of profiles from various other social networking sites. Some are more "colourful" than others. Jerome Orkust at Bebo - This is a typical Bebo profile. monica lacap - This is a typical Friendster profile. nanahara - This is a typical hi5 profile. Auckland University - This is the university of Auckland's hi5 profile. Social networking sites have blossomed over the last few years. As stated earlier, social networking sites such as MySpace, Bebo and Friendster are some of the most visited sites on the internet. People often log in to their profiles to either update them or check out their friends' profiles. These websites provide a valuable space for social interaction. However, it is precisely because these sites are based around social interaction that they could very easily die out. These websites are visited because 'everyone else' is also on them. If 'everyone else' loses interest, the online social interaction momentum will die and there will be a rapid collapse. Knowledge@wharton an online journal for the Wharton business school of the University of Pennsylvanian state precisely this point. Wharton marketing professor David Bell says the long-term success of these sites will depend on their ability to retain the interest of their members. "There is a fad or a fashion component to all these networks. Some will come and go," says Bell. The classic example, he suggests, is Friendster, which burst onto the Internet in 2003 and soon had 20 million visitors. Late last year, it slipped below a million after MySpace and other sites with better music and video capability lured Friendster users away. "A lot of the [success] is serendipitous. These things can have exponential growth. Then, if another community shows up that has better functionality in some way, there can be a mass migration." For example, back in the mid 90's instant messenger programs were very popular there were various messengers competing such as Trillian and Jabber. Now however, there are only a few dominant messenger services. In fact Yahoo Messenger and MSN messenger, the two dominant competing messenger services, now allow Yahoo Messenger users to add MSN Messenger users and vice versa. These websites mostly generate revenue by advertising although a few are subscription based. Traditional advertising can be done by having Vodafone branding and Vodafone advertisements placed based off user's profiles. This is a more efficient method of advertising since users have already filled out their profile. For example, if the advertisement is targeting single people, Vodafone can send advertisments for users whose age is between 18 to 25 according to their profile. Very often, the advertising on a social networking has no relevance to the profile. A good way to advertise would be if the user could actually choose their banners. Vodafone is actually already trying this out with MySpace in the UK. Under Vodafone's MySpace Profile you can actually follow the instructions and access your MySpace profile from your mobile so you can post and receive updates to your mobile. Vodafone New Zealand is trialling it's very own social networking site Self Central which is based around mobile phones. New Zealand mobile phone users of Self Central have their own Self Central "rooms" which they can update. Other Self Central users can visit your Self Central "room" and find out about your latest updates. There is a charge of 25 cents to download content from a room and if other people download your content, you get 5 cents. This incentive creates an interest to update a room and make it interesting. If you're listed as another user's friend, you get any updates they make to their profile sent to you. This means if someone has added some new photos, you would be notified. Using MySpace as an example, by listing Vodafone as their friend, any updates on the Vodafone MySpace are sent to a user. During a big promotion or event, Vodafone users could be notified not only via the traditional text message but also when they log in to MySpace. They can then conveniently just click on the link to check it out on the official Vodafone MySpace. One of the important features of any social networking site is the ability to customise your profile. You could put in music or change the wall paper or even make a completely new theme to reflect what you want others to see. 'Social application' is the term for programs that you can put on your social networking profile to extend what it does. One very simple example would be the music player which plays music for visitors to your social networking profile. One successful branded social application is the Red Bull Roshambull on Facebook. Roshambull is the game of "rock paper scissors" except rather than playing it in real life, you play it over the internet with others. Following Red Bulls idea, Vodafone could create various cool features to extend the functionality of a person's profile that also promote the Vodafone brand. For example, there could be a 'text me' feature where friends can send texts to the person's mobile phone. Viral Marketing is the term for marketing that uses 'pre-existing social networks'. Considering the nature of the social networking websites and the speed of which updates can be spread campaigns utilising this could be quite effective. For example, there could be 'send a friend a vodafone pack' campaign where you can select a Vodafone mobile package and recommend it to friends on Myspace. They will then receive a pack a special promotion leaflet and if they sign up, you get something too. In this case, rather than having to find out what someone needs, their friend would do the work for us. Another form of viral marketing is using prominent members on a social networking website to spread the word on products. For example, if you have a prominent blogger on technology, the blogger could be invited to use and review new Vodafone products. By updating the blog on a profile, others could be alerted to new products being launched. Certain social networking websites such as Linkedin and Xing are for more formal business networking and represents the 'new front' of business. This could be used to get in touch with potential employees and business partners. One other potential usage currently being investigated is to actually use social networking websites within the workplace to enhance employee relationships and provide a virtual space for discussion and project management. As the chief information officer Russell Spratt of the American medical company McKesson mentions, social networking can be used to enhance the business as opposed to being seen as a waste of time. The Economist - On social networking sites for business. Market Watch - On Linkedin's success. CIO sessions - On social networking to assist in the workplace. 1) What social networking is actually most popular in a country? 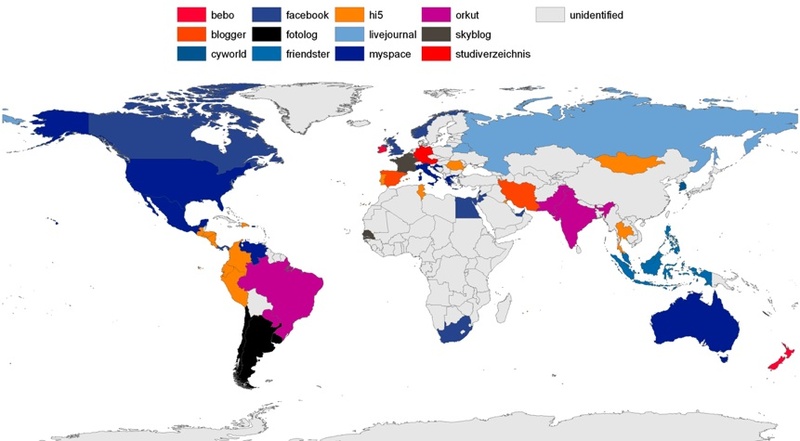 As stated above, different countries favour different social networking sites. This may change in time, so while one might be dominant now, it could be displaced by another. 2) How often does a person check their profile? Most people check their profile at least once a month. This frequency is subject to change over time depending on changes in personal preference. iProspect notes that about 23% of US people surveyed visited MySpace at least once a month but 62% never did. 3) How 'portable' would Vodafone advertising be? Understanding that the dominant social networking might change, would the advertising Vodafone is doing with one social networking site work on another site? For example, the users might be of a different demography. In terms of programming, it might require a re-write of the program so it works with another social networking website. 4) How intrusive are the advertisements? Advertisements are generally an unwelcome but necessary addition to a person's website. How intrusive and relevant are the advertisements on a person's profile? Is there a way they can become welcome or somehow part of a person's profile? For example, perhaps the person could actually choose what company's ads go on their social networking profile. If a person's MySpace profile is linked to the Vodafone UK profile Vodafone ads could appear there more often than others. 5) How likely are customers to go 'viral' and how effective is this compared to traditional forms of marketing? (A)t the end of every e-mail that was sent by hotmail, there was a simple line saying asking Get your free private email at www.hotmail.com. 6) How permanent and sustainable is a social networking website? (Vox's) success indicates a trend among newer social networking sites, which are gaining traction not by focusing on the mass-popularity model that made News Corp.'s (NWS) MySpace famous, but by helping users connect with smaller, more specific, groups. iprospect - On website behaviour for the US. Webad.vantage - On viral marketing. Businessweek - On Vox and niche social networking websites. Social networking sites can be divided into three kinds. The traditional ones such as Yahoo Message Boards, the collection ones such as Youtube and the scrapbook kind such as MySpace. Scrapbook type social networking sites such as MySpace allow users to blog and upload photos on their profile. Users on social networking sites can link to other user's profile and be updated of changes. They can also view and search other user's profiles in order to 'network' and meet new people. Social networking websites have been increasing rapidly over the last couple of years and there are now a large number of people with social networking profiles. No one social networking website completely dominates the world. As the trends show, different websites dominate different regions. There are a variety of ways in which Vodafone can promote their brand on social networking websites; viral marketing and branded social applications are just two ways in which they can do so. There is also a demand for users to be able to access and update their social networking presence from their mobile, as well as their computer. This would allow, for example, people to take photos and video on their mobile phone and then upload them instantly and directly to their social networking site from their mobile.